When you start working after high school, you are not necessarily pursuing a career. I started working for a large insurance company right out of high school. That began me on a path to important life lessons as I served as personal assistant to the VP of Sales. I was lucky to have a wonderful boss that knew when I was at my limit. He said he could see it in my eyes when I was too stressed. That’s when he would step in and make me take a break or tell me to go home. He was the type that really cared about his employees, and everyone felt his generosity. When he wasn’t around anymore, we felt a tremendous hole. Dave had four children and a wonderful wife. He glowed as he talked about them. Seventeen years ago, in the spring, he told me he was going with his son’s scout group for a few days. He put me in charge of things – gave me the keys to his office and files, which is not something he normally did, he left a message on his voicemail that said something to the effect that he was out camping with the scouts and was hopeful to return on such and such a date unless the bears got him. A few days after he left, we received a phone call from his wife letting us know that he had had a heart attack and didn’t make it. I had known the sorrow of grandparents passing away, but this was not something I was prepared for. My heart seemed to explode. Everyone in the office reacted differently. Shock, yelling, quiet tears, noisy tears – phones ringing off the hook, fingers dialing phone numbers as fast as we could to calm the rumors. It was pandemonium, and yet everything seemed to move in slow motion. I couldn’t reach my husband to tell him and I wanted him to know of my heartache. My dear friend and boss was gone. Apparently, the troop had canoed through one lake, then a river, and on through to set up camp across the second lake. He had said that he just couldn’t get warm and felt a little sick. He went to lie down as the rest of the leaders got dinner going. Just a bit later, his son went to call him for the evening meal and he just couldn’t wake up Dad. As they were in the middle of nowhere, there was nothing to do but wait until dawn. They gingerly placed his body into a canoe and paddled their way through the water. They were soon able to get cellular reception and reach the rest of the family who in turn called the office with the news. Dave’s wife spoke to me specifically and asked that I go through his office and collect his personal things. I remember wondering if the faucet would ever turn off. I didn’t realize I had so many tears. At the end of the day, when most of the employees had left, I slowly unlocked his door and just sat there. As I write this now, even as the time has gone by, I can see all of it again. The primitive but treasured art of his children taped to the wall. The awards for his leadership and accomplishments lining the desk and credenza. His presence was ever there. I cried all over again. He was not yet 40 – too young, and now as I am approaching that age, I realize just how young that is. I can’t imagine leaving my own young family at this time. The funeral was a celebration. It was wonderful to see his family and extended family. As we went back to our “normal” routine, I found myself wandering into his empty office that still held of bit of him. I continue to stay in contact with his wife. We go to lunch with a few of us from the office couple of times a year. In early 2009, his wife came across a suit coat, a shirt and a pair of jeans that were tucked away. She came over and gave me his articles of clothing and asked me to make them into Carrie Bears for his grown children. It was my privilege to sew every stitch in between freshly shed tears. What a connection. What treasures! Since my boss’ death, I have lost my own dad and a sweet mother-in-law. It wasn’t any easier, and each person we lose holds a different part of our hearts. But I am thankful for the empty office that gave me experience to know what it is like to feel grief and to know life. 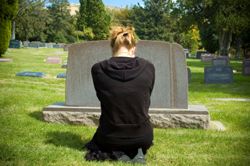 I have seen many people over the years in different stages of the grieving process. And whether it is an empty office or a tangible Carrie Bear, there is a physical connection that takes right back to the person we love. Carrie Pike is the founder of Carrie Bears, www.carriebears.com, a company that helps family members honor loved ones who have passed on. Carrie has also spent the past 20 years in the insurance industry. She is an active community volunteer, and has served for the past ten years on the board of Caring Connections, a program to bring hope and comfort in grief. She resides in Salt Lake City with her husband, Steve, and their five sons.